Monday, April 15, 2019 is "Tax Day," the deadline for filing individual tax returns to the Internal Revenue Service (IRS). LOS ANGELES - There are countless things most people would rather be doing than filling out their taxes. Whether you’re screaming into your pillow because you owe Uncle Sam money, or he owes you, we can all agree on one thing: Everybody loves free stuff. So stick it to the man and make April 15 something to look forward to with these awesome Tax Day specials. 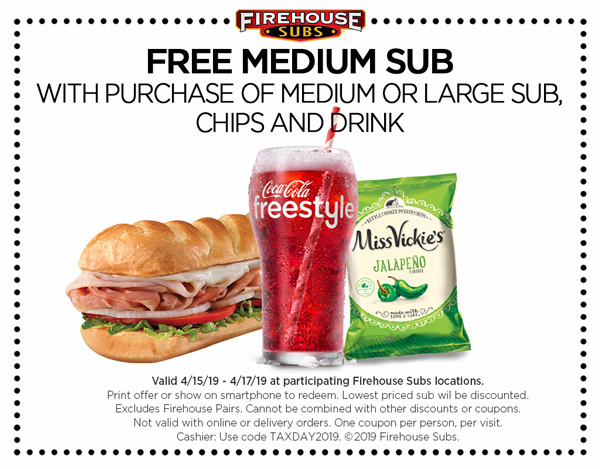 Firehouse Subs: Literally get this bread with a free medium sub when you buy a full price medium or large sub, chips and a drink. The Tax Day deal is only valid from April 15-17 at participating locations. Planet Fitness: Tax season is stressful, with a capital S! So why not let off some steam and zen out with a free hydromassage. The best part about this deal is that membership is not required. If your club does not offer a hydromassage, no worries! The coupon is valid for a free chair massage instead. Compton residents are fed up with the massive potholes throughout the city. On Thursday, they compare some of their neighborhoods to those of a third world country. “To be honest with you, it’s embarrassing as a taxpayer to see the streets look like this,” said one Compton resident. A 29-year-old Buena Park man was in custody Thursday after leading law enforcement officers on a three-hour chase through Los Angeles and Orange counties before he pulled into a shopping center and ran into a 99 Cents Only store, where he was arrested at gunpoint. Alexis Avinai was booked on suspicion of domestic violence and felony evading, according to the South Gate Police Department. He was held on $125,000 bail. Los Angeles County announced on Thursday they are suing Southern California Edison to recover costs and damages from the Woolsey Fire in November. The fire started Nov. 8 and consumed more than 96,000 acres, destroyed more than 1,600 buildings and damaged another 360 structures. Los Angeles County is joined in the suit by the Los Angeles County Flood Control District and the Consolidated Fire Protection District for Los Angeles County.